Planning a party to perfection requires time, dedication and knowledge, this is what the Heavens group do. Whether you wish to plan a special occasion such as a birthday or engagement party or are looking to throw a get together for friends our team of party planners in Exeter can help you create a truly unforgettable experience within your budget. Play for fun and win prizes. Up to 20 different dippy items. Jam out with our DJ’s to your music preference. Make your event a night to remember. Capture every moment and memory forever. Be surprised, outsmarted and amazed by magic. The Fun Casino Package – Casino Table, Magician, Chocolate Fountain & DJ and Disco. Get a real feel for the casino environment with this fabulous package. The Heavenly Package – Chocolate Fountain, Buff Butlers & DJ and Disco. May all your dreams come true in one night! The Ultimate Party Package! 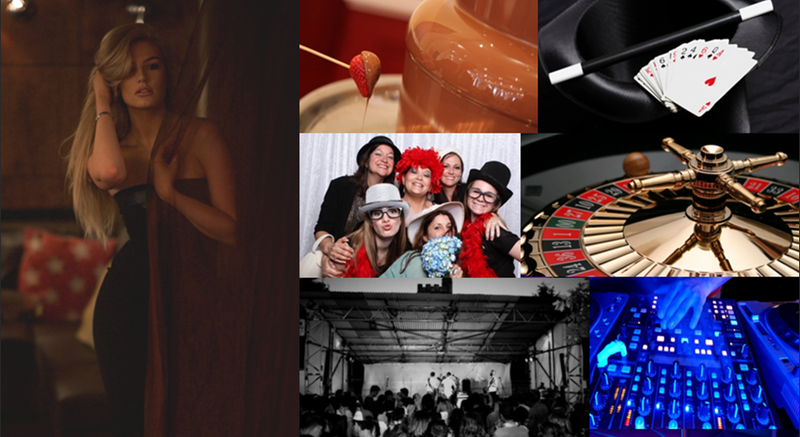 – DJ & Disco, Fun Casino, Chocolate Fountain, Photobooth, Buff Butlers & Hot Hostesses. Why not go big and party all night with our full entertainment package!